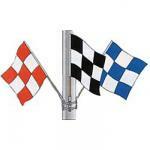 2' x 2' Nylon Checker Flags are finished with canvas header and two brass grommets. 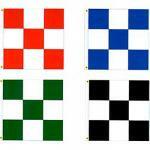 2' x 2' flags have 8" printed squares. 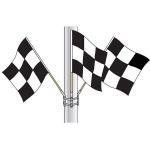 3' x 3' Nylon Checker Flags are finished with canvas header and two brass grommets. 3' x 3' flags have 12" printed squares. 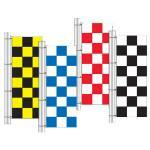 3' x 5' Quality Nylon Checker Flags. Finished with canvas header and two brass grommets. Checkers are printed. Made in America. 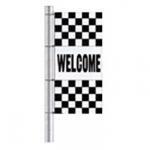 3.5' X 7.5' Vertical Nylon Drape Flag has `Welcome` printed in the middle of black & white checkers, (as shown). Finished with canvas header and 4 brass grommets. 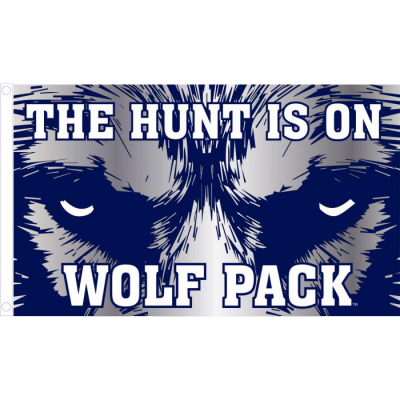 Each flag comes with 4 self-locking nylon straps. 5'x3' Nylon Vertical Drape flags. Finished with Canvas header and 3 brass grommets. 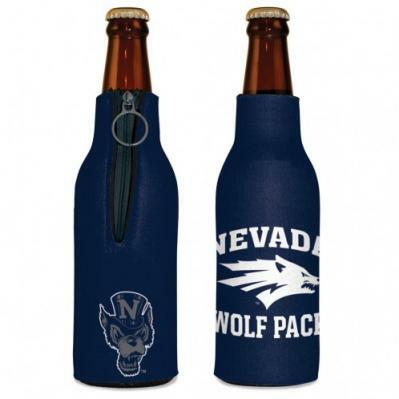 Comes with 3 Nylon self locking straps. 8'x3' Checker Vertical Drape Flags are finished with canvas header and 4 grommets. Each flag comes with self locking nylon straps. Made in America. 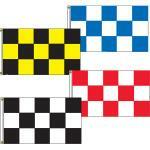 Assorted color set includes three Nylon 3" x 3" flags; one each Red & White, Blue & White, and Black & White. 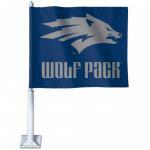 Flags are attached to poles, and comes complete with flag holders and mountings. Made in America. 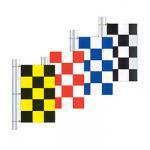 Each set includes 3 black & white checker nylon 3" x 3" flags attached to 11/16" x 48" poles. Complete with flag holders and mountings to hang on pole. Made in America.